This article was published as a guest post at PaidContent, and is republished here for Digital Quarters readers. Media companies have collectively spent billions of dollars on content management systems. As they upgraded their offline businesses to the digital world, they turned to big enterprise systems to organize their content in an orderly digital database. And whether via internal systems or a purchased system, each piece of content knows its place, and the digital migration of media is a fait accompli. But after so much investment in such important systems, why are media companies still miles away from a profitable model? In part, it’s because these intricately designed systems have been based on one big misunderstanding: that a media company’s most valuable asset is content. Content is just a means to an end. The end – and media’s greatest asset – is audience. Media companies over the last 10 years have invested in an enormously expensive card catalog, while spending only pennies to bring people into the library. The big opportunity with digital media is not to organize your content closet or have efficient workflow – it’s about driving demand and building an audience using digital channels and all of the rich data that comes with them. That’s the way to use systems to multiply the topline, not just streamline the expense line. Other industries made the leap a decade ago. The ERP category boomed as manufacturing companies’ inventory tracking systems evolved to fully manage and even stoke demand, with the realization that driving sales is far more valuable than just knowing what you’ve got in the back room. The time has come for companies to step up from tracking data to driving results. And over the last 24 months, huge advances in technology have enabled us to not just capture, but harness, data. The next generation of CMS won’t be CMS 2.0. The technology that powers media companies going forward will be ADS: audience development systems. And it will help media companies that use it multiply their topline and improve their offering to their audience. 1. Manage across the many channels of distribution. Stop thinking it’s just “the web.” Today’s web is composed of myriad channels: Google’s search index, Facebook’s news feeds, Twitter’s tweets, and YouTube’s video marketplace, not to mention pins and tumbles. Each of those channels is more than a dumping ground – it’s a pipeline that, if well optimized, can deliver compounding results for your audience. The TV networks have recognized this for decades: they carefully arrange lead-in and lead-out to maximize audience compounding. Now every content publisher has the opportunity to maximize channels this way – alas, their CMS isn’t built for that. Shift your systems to be oriented around the channels, not the asset. 2. Adjust the focus from audience to individual. The idea of publishing once for “the audience” is absurd today. In the past, we didn’t have the ability to see the “I” in audience. Today, technology enables us to connect with individual users, and to actually get to know them. Showing the same featured article that you showed me last time I visited your home page is a waste of precious attention. Your users expect better, and you should too. A CMS that knows and exploits the differences between you and me will dramatically enhance the value of any media company’s content. 3. Use abundant user data to know what works. Thanks to the social rewiring of the web, Big Data technology, and real-time analytics, data is available to provide feedback and allow programming on all major channels in real-time. Everyone recognizes the incredible audience-building potential of behavioral data, but most companies still don’t know how to leverage it. It’s time to measure not just what you publish, but who interacts with it – and how. Use that data to know what content works for what audience, and what audience works for what content. Personalization is the future of media – and it starts with data. 4. Make your systems look forward, not back. The CMS model of the web is retrospective: it’s a trackling log of content, created, edited, and published once and forever, set on a URL and then forgotten. But today’s web prizes relevance – and relevance right now – above all else. Past performance should impact all your actions – in real time. Predicting, programming, and optimizing your distribution can multiply your ROI on content by many times. 5. Fully socialize your distribution. According to comScore, audiences are spending 1 in every 5 minutes of their online lives on social networks. Social will soon surpass search to become the #1 traffic source to companies’ websites. It’s not what’s published to the web that matters, anymore – it’s what’s published to the newsfeed. A CMS built with Google in mind will soon become irrelevant, while one built to optimize social distribution can capture growth to the tune of many millions of users. Digital distribution, when done right, can have a multiplicative effect: a great piece of content delivered to the right person at the right time in the right package is worth 10x that same content paired with the wrong (or non-existent) distribution strategy. A company that can fully incorporate social, real time, data, channels and personalization into their distribution strategy will dramatically enhance the value of their offering by developing a loyal audience relationship. You heard it here first: the Audience Development System will be the killer app for web companies in the next five years. I was intrigued to find that despite having some of the deepest pockets in the industry, Google seems to have lost a bid for social media marketing company Buddy Media (according to Peter Kafka at AllThingsD). Buddy Media may sound like a counter-intuitive soulmate for Google: Does Google really want to help brands have a presence on Facebook? And those competitive considerations, plus regulatory concerns, might have held them back from paying top dollar. But it’s a shame they didn’t dig a little deeper, because nobody needs a buddy in social more than Google does. As the premier search destination, Google has no trouble earning consumer attention or selling search ads. But in social, the company has struggled. They could keep trying to woo social users with new offerings, or they could try the back door: social advertising. But Google+ doesn’t yet translate into an attractive social ad buy, and so the company’s only option is to use competitors’ platforms (Facebook, Pinterest, Twitter) to broaden their advertising efforts. In which case, a play for Buddy Media was really quite smart. An acquisition of Buddy Media would have helped to protect Google’s position as the leader in online advertising. They control 44% of global ad spend today (compared to Facebook’s 3%), but if social advertising becomes more important than search – and I predict that it will – those tables could turn with alarming speed. Google is struggling to stay relevant in an increasingly social world, and if they don’t find a social buddy, they could lose their grip on the internet advertising needs of their clients. Google needs to stay forward on the leading edge of advertising. And the leading edge is social. When Google acquired DoubleClick for $3.1B in 2007, it was with the recognition that to be a pro-level player in advertising online, Google simply had to have access to advertisers’ display budgets. Now, this interest in social looks like it signals that Google has the same recognition when it comes to social spend. Simply put, the social advertising market is about to grow to a level so high that Google can’t afford not to offer it to clients. Even though Buddy Media would not have solved Google’s top-of-mind problem – convincing users to hang out, rather than search and leave – it would have helped to position them as an expert in social media marketing. And that might have helped them develop, over time and with a new perspective, the formula for that elusive social secret sauce. That alone would be invaluable to Google. It’s no secret that the company that excelled in search doesn’t have social in its DNA, and it is unlikely to change that without help. An acquisition is one of the few course-changing options that could make the difference. More than anything, this week’s news demonstrates that Google sees tremendous value in social. Now that the acquisition appears unlikely to happen, Google needs to turn its attention to other game-changers that could inject it with some social DNA. Of course, Pinterest and Twitter should be on the list, and are probably worth far more to Google than any financial valuation would suggest. But just as valuable would be a company that uses the social web to drive usage, audience, or conversion. Each of these would help Google advance its media offering and rewire itself for social. Stay tuned: I bet more news will be coming soon. It’s good to see Google getting more aggressive. I was pretty excited in December when Wetpaint Entertainment became the #1 social publisher on the web, but this month’s Social Leaderboard chart is like that rare but spectacular sunny day in Seattle. For the sake of modesty, I’ll explain further down the page. Unfortunately, the sun isn’t shining on everyone. Total social traffic to the Top 50 publishers fell by 13% in April. As for social traffic as a percent of overall traffic, the average publisher lost 1.5 percentage points. In fact, 48 of the Top 50 publishers lost ground on social traffic composition this month. Facebook’s April experiments and changes to the EdgeRank algorithm are likely to blame. Publishers who put Facebook at the center of their distribution strategy were able to rebound quickly, while others fell behind. MTV made good on its reputation as one of the most social-savvy TV brands by breaking into the Top Five (and bumping CBS down to #7). People reclaimed the #2 spot that it ceded to NBC in March. Three new players showed up in the Top Ten this month: welcome, The Guardian, Patch, and Yahoo!! The Guardian gets the “most improved” award for advancing from 14th place all the way up to #6. Of course, as in The Hunger Games, we can’t all be winners on the Social Leaderboard. MLB, Break, and Us Magazine – three publishers who have consistently been in the Top Ten since January – were washed downstream in April. Us Magazine in particular is all wet: after slipping slowly from #3 to #5 to #6 over the last few months, it plummeted to #18 in April. Ouch. And Who’s Outperforming the Rest by 3X? Not only is Wetpaint Entertainment the #1 social publisher for the fifth month in a row, but we’re now getting 38% (a Leaderboard record) of our traffic from social. That’s more than 3x the social traffic of the second-best social performer (People), and almost 8x the average publisher (Top 50 average = 5%). All in a month where we had record reach, as well (more on that soon). Thanks to the team for working so hard to build and execute a best-in-class social distribution strategy that’s a cut (or two or three) above the rest. Mark Zuckerberg’s baby will be coming of age in a few days, just eight years after it was born in a Harvard dorm room. We’ve been there for the first steps, and the first missteps. But do any of us know what Facebook-all-grown-up-as-a-public-company will look like? Facebook has become home base for users in many ways. But when it comes to search, Facebook makes you take a bus transfer at Google every time you want to leave the house. And that’s a shame, because Google starts each search from a place of knowing almost nothing about me. When I’m taking a vacation to Bali, I’m far less interested in Google’s generic recommendations of things to do than I am in recommendations from my friends who have been there. Facebook already knows which of my friends have been to Bali, and which restaurants and attractions they liked the best. It can even differentiate between the friend I trust for restaurant recs and the friend who always finds the best surfing spots. 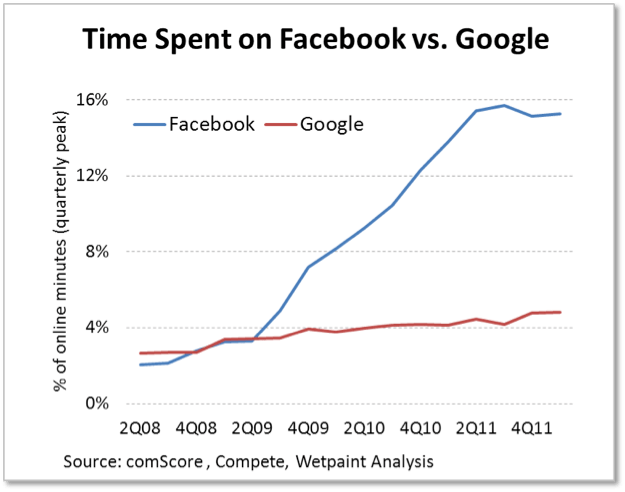 There is a clear battle between Google and Facebook. But it’s not over “search vs. discovery,” as it is often framed. Rather, it’s “transaction vs. relationship” — which is why Facebook has the potential to disrupt search as we know it. Prediction: Facebook will launch a purely social search by the end of 2012 (before tackling the whole hog in 2013). Despite the company’s fierce ethos of consumer experience first, business concerns second, an IPO will inevitably put upward pressure on the latter. With the numbers published quarterly and the prices reset every day, Facebook will be forced to support that share price (if not for the sake of its shareholders, then at least for its employees!) by expanding its advertising revenues. Facebook today brings in quarterly ad revenue of $872M — just a tiny fraction of Google’s $9B. But transactions are by nature pecuniary — and relationships are priceless. As a gatekeeper to nearly a billion consumer relationships, Facebook can roll out new advertising products that are far more valuable than AdWords. The market for online brand advertising is already huge at $85B today. As soon as Facebook unlocks the potential of relationship-based advertising, the market will open up by tens of billions more. Prediction: By Q2 2013, Facebook will have more than tripled ad revenues to $3B per quarter. Occupy Facebook! Oh wait, we already do. Or does Facebook occupy us? Facebook currently occupies 1 in 7 minutes of all time spent online. As the locus of consumer identity, attention and relationships, Facebook has the potential to be the one true platform that links together every destination on the web. But it’s not there yet. Open Graph was a start, but it lacks a complete and actionable vision for how publishers can connect, access data and establish relationships. Publishers don’t want bits and pieces of data that they need to analyze themselves — they want a unified schema that bridges their audiences’ online worlds and real lives. When I buy a chicken at Whole Foods using a Facebook app’s mobile grocery coupon, Facebook can match that incoming data point with the fact that I read Cooks Illustrated and that I’ve been on an Indian food kick lately (based on my restaurant check-ins). By the time that chicken is in my reusable bag and I’m hauling it out the door, there should be chicken curry recipe suggestions on my Facebook page. Facebook has an opportunity to turn data from the long tail of Facebook apps into real inferences about you and me that publishers and other brands on the web can actually use. Prediction: Facebook will completely redesign their analytics offering by Q2 2013 to provide not just data but real, integrated audience insights that will guide brands’ personalization efforts. Advertising won’t be the only revenue play Facebook makes in its first year as a public company. Digital commerce (i.e. digital goods) already represents more than $16B in market size, and is projected to grow to $36B globally by 2014. E-commerce is another $680B on top of that. Both are currently conducted by arcane means: Visa card numbers and PayPal accounts. Why have digital payments been so slow to evolve? Because even the most trusting of us only allow a few close associates access to our most private details. Who knows me the best? My bank, my lawyer, my mother and Facebook. In fact, no one owns my identity as well as Facebook these days (sorry, Mom!). Just because Facebook doesn’t have access to my wallet yet doesn’t mean it’s not going to happen. A host of companies today (Google, Apple, Square) are trying to become your digital wallet, but Facebook holds a valuable advantage: it is already the locus of your relationships with third-party Web sites through Open Graph. While the logistics will certainly be no piece of cake, commerce is right up Facebook’s alley. Prediction: By Q2 2013, Facebook will be presiding over $2B in transactions. There’s nothing more core to Facebook than its user experience, and Facebook has since its birth shown a consistent healthy dissatisfaction with it no matter what the status quo. The current timeline experience is a nice try, but it’s not quite right. Timeline solved one problem — the indigestible frequency and quantity of updates at all levels of priority — while creating several more. New Problem #1: Timeline’s intuition about what’s important is too frequently just plain wrong. And while it gives us a great retrospective on people, it does a surprisingly poor job of helping us stay up to date with them. New Problem #2: Timeline depends heavily on Open Graph widgets to summarize our lives. The latter is both ambitious and troubling. We admire great biographers for their ability to identify and communicate the essence of a person. It’s an insult say that a Nike Fuel score algorithm can capture the “real me” in the same way. Timeline is a v1 product. It will take significant and deep tuning over many versions to reach its full potential. This may seem like it’s just a UI update, but it’s not. Timeline is the clearinghouse for everything that happens on Facebook. Getting Timeline right is probably the single most valuable thing Facebook can do to grow its effectiveness with users — and its revenues. Prediction: Facebook will release the first major redesign of Timeline by the first half of 2013. Will the precocious kid that Facebook is today grow into a smart, savvy adult? A boatload of investors and J.P. Morgan certainly seem to think so. Over the long term, it will depend on Facebook’s ability to leave its youthful single-minded focus on users behind and execute consistently against two metrics: great user experience and revenues to match. This article was selected from Ben Elowitz’s Media Success newsletter as a special feature for AllThingsD’s Voices column. “Content is king” has been a long-lived mantra of media. And in the 1990s and early 2000s, it was true. But over the last several years, the Internet has upheaved the aphorism. It used to be that media was linear. And in that world, content and distribution were married. The HBO channel had HBO content. A New York Times subscription bought you New York Times content. And Vogue and Cosmopolitan each month delivered exclusive and proprietary content from … Vogue and Cosmopolitan. Until the Internet came along. In every single one of the varied businesses the Internet has touched — from commerce to media to communications to payments — there has been one common impact: disaggregation. In the case of the hundreds-of-years-old media business, the Internet has fundamentally separated content from distribution. Today I can watch hundreds of South Park and Jon Stewart clips, all without a cable box — on my Apple TV, my Android phone, or YouTube on my desktop. But wait, South Park and Jon Stewart? Content is king, you say. It’s now even more free to reign, unfettered by distribution channels! No; because content is no longer enough. Content has always been a means to an end. And the end has always been audience. Content isn’t the goal. Audience is. When it comes to the business of media, there’s no question: advertisers don’t pay to reach content. They pay to reach an audience. What’s the first item in every brief from every advertiser? It’s not Target Content, it’s Target Audience. Media has been slow to adjust to this new dynamic. Companies have sunk billions into content management systems — using CMS as the cornerstone of their modernization — under the impression that they traffic in content. But they don’t. They traffic in audience. And how much have they spent on audience development systems? Not much, if any at all. Now that distribution of content to audience is no longer linear, distribution decisions are suddenly more complicated. And, at the same time, they are immensely more important — and more dynamic — to create the impact media companies are looking for: drawing an audience! Social distribution can outperform search, if you use it wisely. Day-parting your postings can boost post performance by 100 percent or more. Packaging can triple the effectiveness of content in reaching an audience. And yet, few in media have even begun to optimize these decisions. Who’s your Chief Audience Officer? Distribution decisions are just as important as content decisions in building and serving an audience, and yet they are being largely ignored. Everyone has an Editor-In-Chief or a Chief Creative Officer. But how many have a Distributor-In-Chief? Or a Chief Audience Officer? A Head of Digital Programming? The myopic focus on content over distribution is widespread, and it’s a bad business decision. It ignores a critical access of leverage, and one of competitive advantage. 1. Put someone in charge of audience development. Give them latitude to think about the interplay between distribution and content, so that they can marry the two. Like a head of programming for a cable network, they should be tasked to realize the full potential of your digital channels. They should support the delivery of your content, and they should also provide back pressure to your content creators. Don’t merge it into your editorial jobs — that’s too precarious. Make it its own discipline. 2. Adopt an audience development strategy. There are three basic components you have to master: insights (know your audience segments, and what each one will like); channel selection (identify the highest value distribution outlets for your brand, whether it’s search, social, YouTube, Hulu, or your own channels); and optimization (use data to create a feedback loop and tune your content, packaging, and timing to what works for your audience). You have sunk millions into content management systems. But how much have you spent on your most monetizable asset, your audience? You should be as systematic in audience development as you are in content creation, if not more so. Whether it’s with established processes or dedicated algorithms, make audience development a competitive advantage. Get so good at it that you truly know how to maximize every piece of content you create — and multiply your ROI. Use technology for what it does best: Systematize your advantages over your competitors. With the rise of new distribution platforms like Facebook, YouTube and Hulu, there’s no question that the next generation of digital media is as much about distribution as it is about content. Media companies that orient their organizations to prize audience development above all (with distribution as a key component) will catch the upside of these tectonic shifts. And they will be the ones that survive and thrive in the digital age. After all, audience is the ruler of media companies’ fortunes. How much social traffic did the top 50 web publishers attract in March? The results are in – and it is a mixed month. Measuring by total visits, March was the second highest month on record for social traffic to the top publishers. The number of social (Facebook + Twitter) visits to the top 50 grew by 2.9% in March to 403 million. Volume growth aside, social’s share of traffic to the top 50 dropped slightly, dipping by 0.3% in March. That’s because even while traffic from social grew, it didn’t grow as fast as traffic from other sources. What gives? It’s possible that each and every one of the top publishers’ social media teams was distracted last month by March Madness and solar flares. It’s also possible that Facebook’s aggressive mobile push is putting downward pressure on this measurement (the comScore data we use for benchmarking overall site traffic doesn’t include mobile traffic, alas). The solar flares must have been particularly distracting to one publisher’s social team: Us Magazine continued its downward slide, falling out of the top 5 entirely this time after dropping last month from 3rd to 5th. NBC is on a roll, climbing up another rung (after jumping two spots ahead in February) to #2 on the leaderboard. NFL also ran the ball for an impressive number of yards, moving from #9 to #5. Wetpaint Entertainment continued to hold a definitive lead, outperforming the closest rival by 9.3 percentage points. We’re able to maintain this lead by constantly improving our proprietary social analytics and distribution system through rapid experimentation and a deep understanding of our audience. The amazing thing is that our social growth has not come at the expense of search traffic. Indeed, our search traffic has been rising as a result of our social success, and total traffic has recently hit record highs of 10 million uniques and more. And we’re not done yet – social users are the most valuable users, and we want more. All social networks are not created equal. We tend to think of Twitter as some kind of Facebook Lite, but this puts us at risk of missing the fundamental differences that make each platform valuable in its own way for brands and publishers on the web. Facebook is a hub-and-spoke social network. I share, you share, we all share with the common goal of promoting our identities within our social circles. The assumption is that we share our lives – at least as we’d like them to be seen – with our friends. Twitter, on the other hand, is an interest amplification network. One person shares, one thousand people listen, and some retweet to thousands more. On Twitter, the basic assumption is that tweeters share their interests with their followers. And, with reverb built into the network, that followers do the same. In this asymmetrical network, ideas can spread farther and faster. And because Twitter’s connections are interest-based rather than relation-based, they transmit with far more “gain” on the signal. But how far, and by how much? Both Facebook and Twitter hold huge potential for publishers, and yet they are measured quite differently. When a publisher posts to Facebook, they have a pretty good idea of the impact: ~16% of a brand’s followers see a typical post. As with a radio tower, the signal is broadcast once and (while it may reflect here and there) largely travels by line of sight to its listeners. The actual reach and impact of a tweet, though, remains nebulous and hard to quantify. It’s impossible to track how many of your Twitter followers actually read a tweet, and Twitter hasn’t offered any guidance on the norm. But above all, Twitter is hard to quantify because the real value of a tweet comes from the ripple effects it creates outside of the Twitter stream. If Facebook acts like a broadcast tower, Twitter acts like a newswire: think about its “tune in” format and its penchant for news-breaking. More and more, journalists and bloggers are getting their news tips from Twitter and repackaging those stories for their own online readership. Which means that one little tweet (unlike a typical Facebook post) can travel a very long way. In fact, the total impact of a tweet can be anywhere from 1-20x the direct traffic you see from that tweet. At Wetpaint, an average article gets 3% of its traffic directly referred from Twitter.com. If a particularly influential person happens to tweet about one of our stories, however, that number goes through the roof. When Grant Gustin (otherwise know as Sebastian on Glee) tweeted a link to the story “Grant Gustin has Superbowl Spirit,” Twitter’s traffic contribution shot up to 55%. The same thing happens outside of the Twitter stream when our followers pick up on a story and blog about it – we see up to 20x the typical Twitter traffic in ripple effects. It’s all well and good when that happens, but as publishers how do we consistently effect that kind of outcome? Do we relentlessly pester celebrities and bloggers to follow us on Twitter, or amass a giant following in the hopes that some small percent will turn out to be influential? How do you tweet for maximum ripple effect? Sounds easy enough: we all know that an Oprah is worth 1,000 Snookis, and a Snooki is worth 1,000 Elowitzes (sorry, mom!). But celebrity isn’t everything: even better than a Snooki just may be a Stelter. Brian Stelter doesn’t have the consumer name recognition of Snooki, but he’s far more influential in setting the agenda of the media and entertainment press. Influence is all about relevance – and when Brian tweets, the ripples can travel far. Once you’ve identified the influencers most relevant to your audience, it may suddenly become apparent that they’re, well, a bit inaccessible. If Lady Gaga happens to be your target, then it’s time to get creative. Who are the influencers of your influencer? Every person’s interests are shaped and guided by the people around them. You might read an article about silent retreats after your yoga teacher mentions her recent stint at St. Benedict’s, and you might start reading PandoDaily when your best friend launches a tech startup. Highly influential people are no different – they pick up interests and news from their sister, their friends, and if they’re really doing well, their driver. If Gaga retweets her barista, pursue a relationship with him. And if the barista often retweets his mom, see if she might be interested in what you have to say. Once you’ve made a list of all the friends you want to make, start earning their friendship. Relationships – whether digital or IRL – can’t be faked. But they can be stoked. Comment on their posts, offer them resources, and genuinely engage with them. Just like in life, once you have a friendship, you can make asks from time to time. And – again just like in the offline world – I’ve found that it’s always best to lead with giving for a while before even thinking about what I’ll get in return. It’s not an overnight process. Earning influence is just as hard in Twitter as it is in real life. That’s because Twitter is a network of people, not a technology. These are just a few basics for starters. At Wetpaint we’ve gotten this down to a science: we have analytical frameworks for identifying influence surround rings and continuous A/B testing to optimize every interaction. But it all always comes back to real people building real relationships based on real interests. In the end, even with all that technology to help us, I think it’s the real personal nature of relationships that have helped us be so successful with our audience. And that’s what inspires our audience to honor us with ripple effects by passing on our content to their own friends.